Here at Burger 10, we specialise in diverse range of Burgers. Simply, offering world’s best 10 burgers from 10 countries in one single roof. 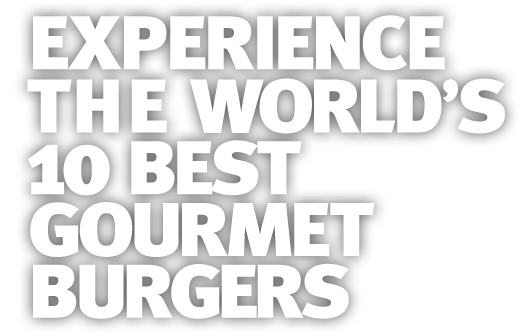 We pride ourselves on our gourmet burger made with 100% Australian production. All our burgers are grilled to perfection so you won’t have to worry about stacking on those extra kilos. Our ingredients are fresh, ripe, and bustling with goodness. A scrumptious and filling burger that will satisfy your tastebuds! Important Notice:Our burgers are all made with the freshest ingredients. We only use top quality meat to maximize its flavour. If you would like your burger cooked differently, please just let our friendly and helpful staff know when you place your order. Thank you! A refreshing crisp well balanced wine showing fresh tropical fruit flavours & grassy notes. A lively fruit driven characters of white peach & lime, balanced by crisp acidity to create a refreshing wine. A pale straw colour & has a ripe apple nose that carries through on the palate. It has flavours of cooked pear, lemon citrus & mineral with hints of orange & melon fruit. A light bodied red wine with layers of black fruits & plums, which are well supported by hints of spice. Spicy, peppery aromas on the bouquet coupled with a luscious, sweet berry palate typical of this grape variety. Ruby red colour, intense vinous smell with notes of raspberries & spices.